Quick searing seafood is a fabulous technique, especially if you like a brown and crusty finish. A fishes short bands of quick twitch muscles (as opposed to long, slow-twitch muscles in mammals) cook VERY quickly, so if you want a nice brown finish, you’ve got to cook it fast and hot. Quick searing in a pan, on the grill, under a broiler, in a hot oven is the best way to go. Start with a large, heavy pan; it makes all the difference! The more metal in the pan, the more heat it holds, which is key! A large heavy pan will heat more evenly and better hold it’s temperature when the fish is added, searing immediately. I use Calphalon, Lodge and DeBuyer pans, pictures below. The best oils for searing hold up to higher temperatures; I suggest canola, peanut and coconut oil. Olive oil can add a lot of flavor, but burns at a lower temperature, so it can be blended with another oil, or choose Picual olive oil because it has the highest smoke point. Preheat the pan over the flame level you plan to cook with for the greatest control – don’t crank it up on high and then reduce to cooking temperature, trust me on this one. I heat my pan over medium to medium-high flame to about 380-400° for searing – this is generally the temperature that the oil shimmers and can start to smoke. Touch a corner of the fish to the pan to check temperature, or better yet, use a laser thermometer, a handy tool you can get at many auto parts and hardware stores. Choose the right pan. A large, heavy pan is the key to great pan searing – the larger and heavier the better! Keep the fish as cold as possible before cooking to better promote browning without overcooking. Fishes cook faster than meats because of their muscle structure, so the key to great searing without overcooking is a hot pan and a cold fish fillet. For thick fishes, use lower temperatures – thin, higher temps. Add a swirl of oil to the pan (stick free pans need less oil, even a mist will do – but skimping on the oil reduces the brown crust). When the oil is shimmering hot, add the fish and leave it alone, don’t turn it until it browns! It may stick at first, but as the crust forms you can shake the pan or use a spatula to release. Once the first side is good and brown, carefully turn over and repeat – removing from the pan before the fish gets overcooked – I generally sear about 3-4 minutes on the first side, and 1-2 on the second side – focusing on getting at least one nicely browned face, but not overcooking the filet. Irresponsible practices are rampant in both wild fisheries and aquaculture, especially in third world countries. The resulting disgraceful (but cheap!) products are dumped on American markets at a fraction of the price of responsible local products – and they are VERY common in grocery stores and restaurants. We may save a buck, but the planet pays the cost – and often the damage to ecosystems, habitat and species is forever irreversible. Unless we go out of our way to avoid these and other irresponsible products, we’ll eat them every day and our dollars will continue to support these misdeeds. Also great with catfish, char, steelhead, salmon, halibut, striped bass, trout, mahimahi, lake perch, etc. 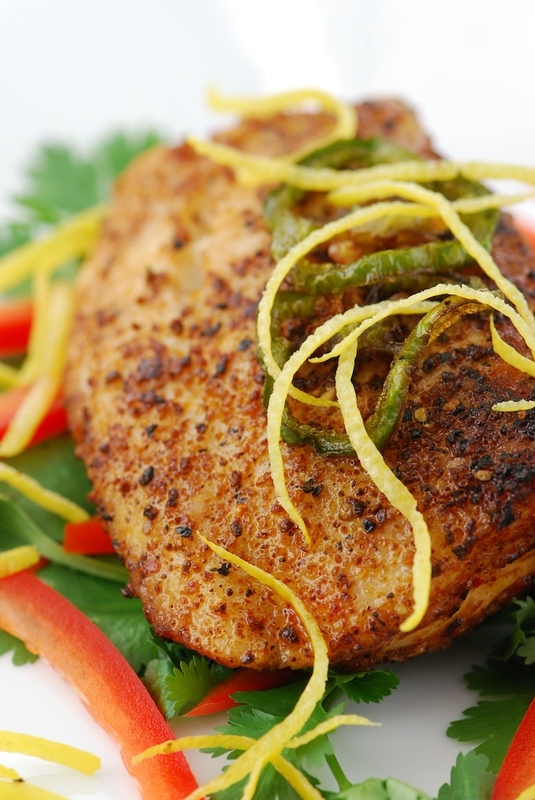 Season tilapia fillets generously on all sides with Chef Mick’s Chile Arriba! Sea Salt Seasoning – it would also be excellent with our Harissa Grill and Stir Fry, Cajun, or your favorite zesty blend. Preheat a heavy 12-14 inch skillet over medium high heat. Add oil to pan, swirl and when shimmering, add fish fillets, browning well on the first side, turn and repeat on the second side – estimate about 6 minutes total cooking time, depending on conditions. Meanwhile, fry jalapeno slices in oil alongside. Remove both fish and jalapenos to a rack. Chef’s Note: Picual olive oil is only made from Spanish picual olives, and not blended. I choose it for several reasons. 1) It tastes great right from the bottle 2) Picual has the highest smoke point of any olive oil so it is the best choice for cooking, even low temp frying. 3) The price is very reasonable! *Tilapia, a freshwater perch originally from the Nile River, grows well in captivity and thrives on a grain-based diet. 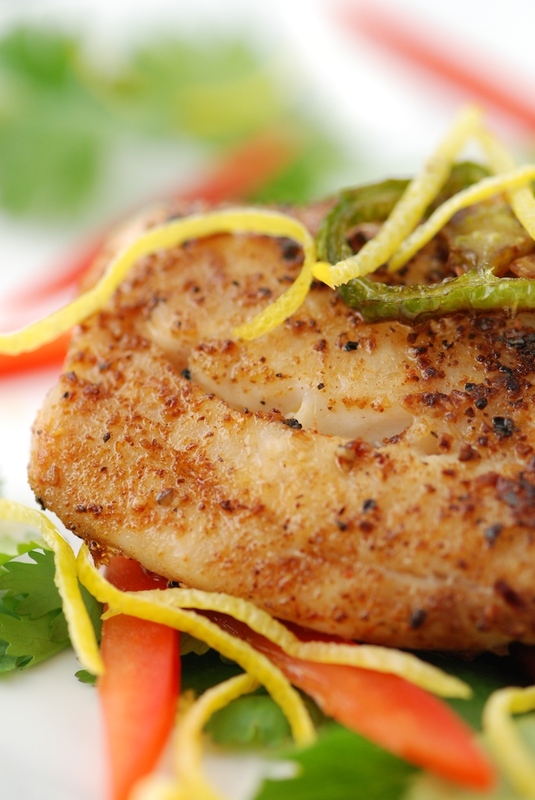 We choose to only carry tilapia responsibly farm-raised in the USA or Costa Rica. Other great choices include Colorado striped bass, catfish, trout, salmon, char, steelhead and perch. I love that Tony's practices and teaches about sustainable seafood. It starts with our actions!